Help Your Child Master the Math Facts for Good–in Just a Few Weeks! The math facts are the building blocks for all of the more complicated calculations that children need to learn (such as adding fractions, subtracting decimals, multiplying multi-digit numbers, and long division). When children don’t learn the math facts, they struggle with these harder topics, because they waste so much time and energy on simple calculations. That’s why it’s so essential that children learn the math facts by heart. 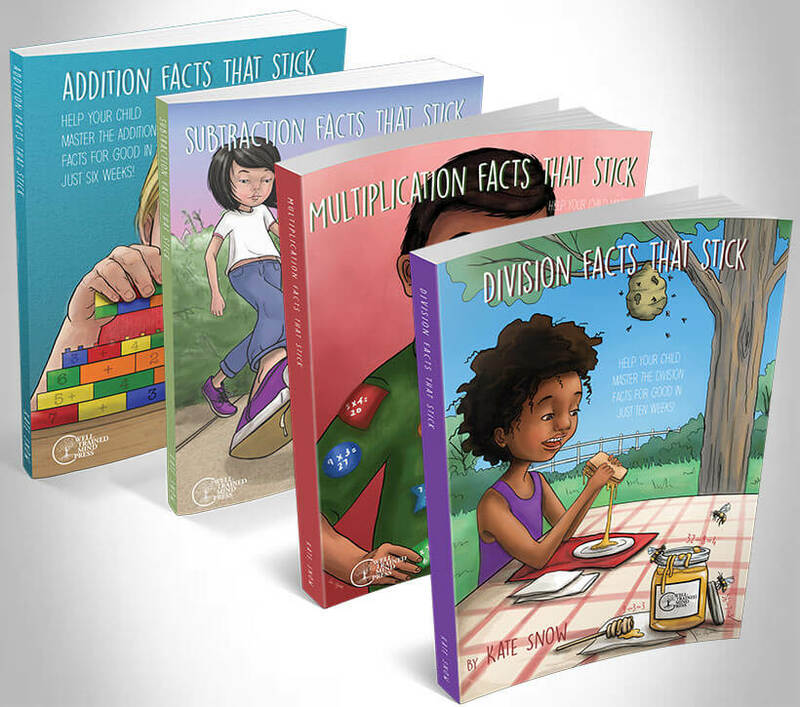 The Math Facts That Stick books–Addition Facts that Stick, Subtraction Facts That Stick, Multiplication Facts That Stick, and Division Facts That Stick –are fun, engaging guides that help parents teach their children the math facts once and for all, without spending hours and hours drilling flash cards! Ideal for children ages 6-12, the series guides parents, step by step, as they teach their children to understand and memorize the math facts. Hands-on activities, fun games that children love, and simple practice pages help students remember the math facts for good. 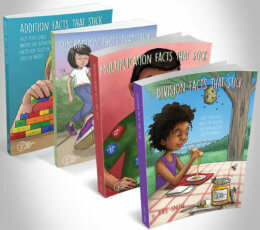 Addition, subtraction, multiplication, and division are each covered in their own volumes. All it takes is a few minutes per day (perfect for after school, or as a supplement to a homeschool math curriculum) to help any child master the math facts, gain a greater understanding of how math works, and develop greater confidence in math. Here’s how the program works: Your child will focus on one section of the math table each week, and you’ll spend about fifteen minutes per day working on the facts together. On the first day of the week, you will show your child a strategy for solving the focus facts and play a fun game that practices those facts. For the rest of the week, you will play the new game together each day. Your child will also complete a short practice page each day to cement the focus facts and review all the other facts learned so far. Instead of drilling math facts over and over so that your child is exposed to the right answer enough times to memorize it – which is time consuming, tedious and often frustrating – your child will practice using stepping-stone facts until the answers become automatic. With consistent practice at finding the answers to math problems, your child will get faster and faster—and before long, they will “just know” the answers and have them fully mastered. Save by buying the whole series at once! Schools and co-ops: Contact us at [email protected] to get bulk discounts and copying licenses! Kate Snow is a math educator on a mission to help parents raise kids who are capable and confident in math. With experience as a homeschool parent, classroom teacher, and curriculum writer, she holds a B.A. in Mathematics from Harvard University and an M.S. in Elementary Education from Walden University. Kate is the author of Preschool Math at Home: Simple Activities to Build the Best Possible Foundation for Your Child and the Math Facts That Stick series. She writes at kateshomeschoolmath.com. A simple, effective program to help your child master the addition facts once and for all, in just six weeks—without spending hours and hours drilling flash cards! Help your child master the multiplication facts in just minutes a day with this fun, engaging program. 5 out of 5 Amazing!! After trying literally everything trying to teach my kids addition and subtraction I was so disappointed at my self and was constantly thinking I failed , what I mean I was always believed they should know everything by heart ( we’re working with Singapore math us edition). They learned but they didn’t really like to do math at all and I’m thinking here it’s my fault bc i pushed them to far, long story short I decided to try this , word can not express my gratitude to Kate Snow 💖💖 remember my kids were already know how to do addition and subtraction but I wanted them to master it, after we were done with first lesson my kids were beginning me to play again 🤪😁 and it’s been like this since day one! They’re excited to play cards , bingo….. Currently we’re doing multiplication and they’re loving it! I suggest to do the bundle it will save you time & energy & more importantly your kids will enjoy learning this subjects!! My kids are 5 and 4 years old we’re currently working with Singapore math. Thank you so much for this amazing learning method!